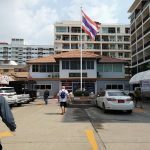 When visiting Pattaya, choosing the right area to stay is as important as picking the right hotel. 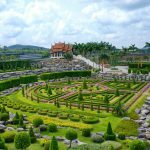 Those who are looking to experience the nightlife and energy that Pattaya has to offer are going to want to stay in a different area than those looking for a quiet and relaxed holiday. 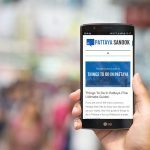 That’s why we created this guide – to help you choose the best area in Pattaya to stay based on your needs. We’ve also included a few recommended hotels in each area for you to look at. While the best location for you to stay is going to come down to personal preference, Central Pattaya is one of the most preferred. It places you in a great location with restaurants, nightlife, and shopping within a short walk. If this is your first trip to Pattaya staying in Central Pattaya is a great choice. Below we’ll go through each area so you’ll have a good idea of what to expect and be able to decide which area is right for you. The farther north you stay in Pattaya the more subdued it gets. This area of town is home to some of the larger international hotel brands and is a quieter area of the city with less action. 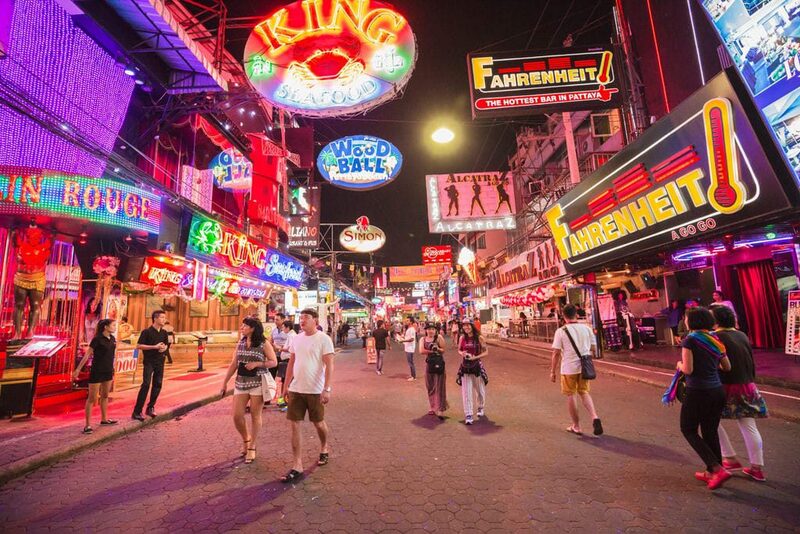 In contrast, it is also the home of Soi 6, one of Pattaya’s most infamous nightlife areas. The area to the north of Soi 6 can give one the feeling they are in a different city entirely. While there are a few beer bars scattered about, the nightlife in this area is pretty tame. However, it is home to a number of massage parlors like the Honey 2 and Sabai Dee. It’s an area best suited for those wanting a quiet stay, but still close enough to take transportation to the action. Not great for those who like to walk most places, you’ll be using the baht bus or moto-taxis a lot. If you want to stay in a location that has everything you want or need within walking distance, Central Pattaya is the area of town for you. There are endless restaurants, bars, and shopping all close by. This area of town is the center of the nightlife. The streets are lined with beer bars from Beach Road all the way back to Third Road. The liveliest area of Soi Buakhao is in located in Central Pattaya with the nexus at Soi Diana and LK Metro. If you want to venture off to Walking Street or Soi 6, they are a quick Baht Bus ride away (in opposite directions). This is the recommended area to stay for first-time visitors to Pattaya. Nightlife: Soi Buakhao, Soi Diana, Soi Made in Thailand, LK Metro…and too many more to mention. The South Pattaya area begins at South Pattaya road and continues on to Jomtien. The area around Walking Street is crazy busy at night. Not an ideal place to stay unless you love Walking Street and don’t plan on sleeping. Once you get away from that area South Pattaya starts to become a lot more laid back and more residential. This area has some nice resorts near the Phratamnak hill area. This area might best be suited for those looking to have a quieter stay, with occasional trips into town. Alternately, for those who want to be in the middle of the mayhem and expect plenty of late nights might enjoy staying in the Walking Street Area. Probably not suited for the first time traveler. 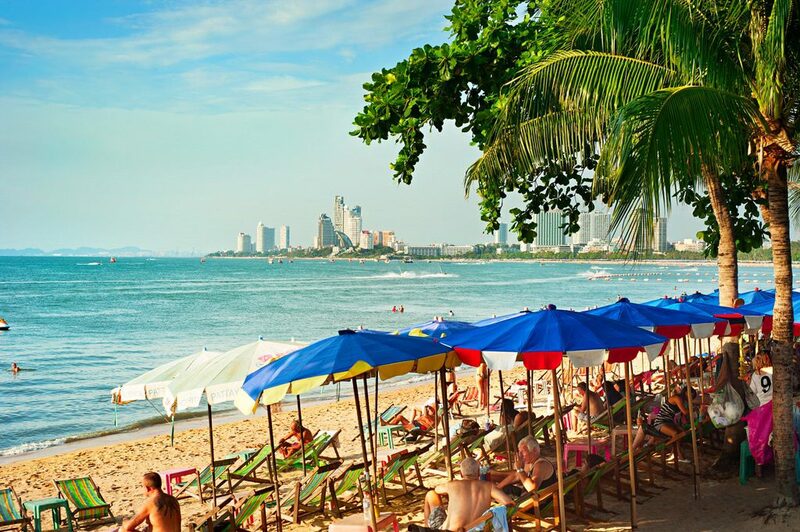 Jomtien Beach is located to the South of Pattaya and visitors who choose to stay in this area of town can expect a slower pace and more relaxing atmosphere. While there are pockets of bars and some nightlife to be found, it’s probably not the place you want to stay if you expect to be out partying most nights. 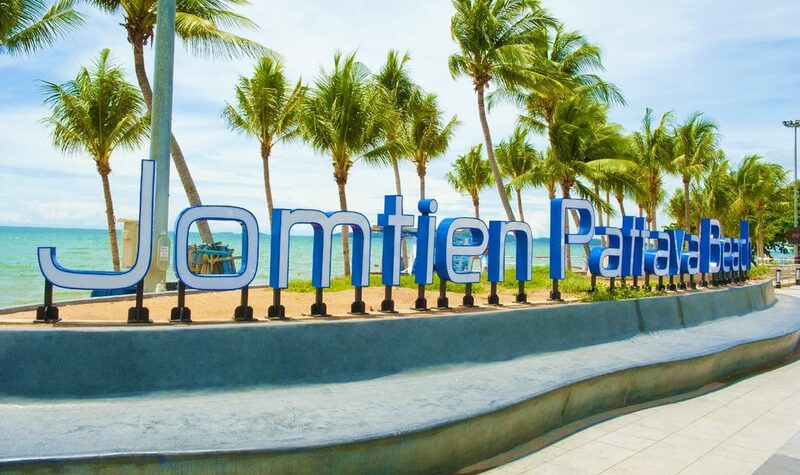 Jomtien has some of the nicer beaches in Pattaya and several large major attractions like Nong Nooch Gardens. 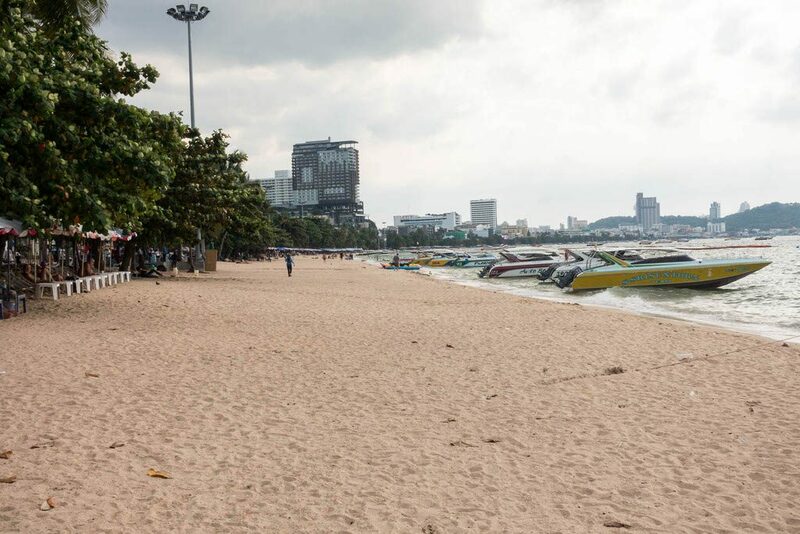 Be aware that Jomtien stretches far to the south of Pattaya and depending on the hotel you choose, you could be a 30 or 40-minute drive into Pattaya. 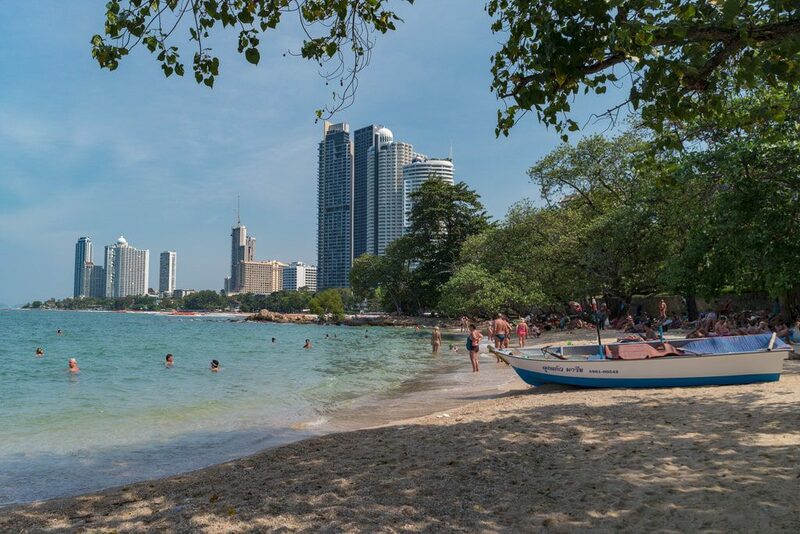 The Naklua and Wong Amat area are quite popular with families, package tourists, and those not interested in the lively nightlife on offer in Pattaya. It is located to the North of Pattaya, past the dolphin roundabout. While it is not far from Central Pattaya, you will have to take transportation to get there. There is no direct baht bus route and you will need to change buses half way through in order to get there. Not really a great place for newbie’s interest in nightlife visiting Pattaya on their first trip. The hotels recommended in our Where to Stay In Pattaya guide are all guest friendly. They are mid-range hotels with all the creature comforts and have free wi-fi. If you want a greater selection of hotels above those recommended here, please check out our guest friendly hotel guide for more choices. If you have any questions on the areas or hotels in Pattaya. Please leave them in the comments below and we’d be happy to help. Image Credits: Joyfull/Shutterstock.com, nuk2013/Shutterstock.com, hunter2871/Shutterstock.com, fokke baarssen/Shutterstock.com. Where should I stay if I want to visit The Sanctuary of Truth, Botanical Gardens, Buddha Mountain, Viharnra Sien, and Wat Yansangwararam? I would like to visit all of those places. Also to see everything will 3 days suffice? Thank you! Most of the sights you mentioned are in Jomtien, except for the Sanctuary of Truth which is in Naklua. If all you are interested in is sightseeing, then staying in Jomtien would be a good option, putting you close to the majority of sights. If you plan on indulging in the nightlife and craziness of Pattaya, the Central Pattaya area is a great place to be. A taxi to Nong Nooch and other sites is probably a 40-minute drive from there. It’s really about what you want out of your stay. Jomtien is a quieter and more laid back area to stay. As far as hitting all those sites in three days, it is doable. You could visit The Botanical Gardens and Buddha Mountain one day, Wat Yan and Viharnra Sien on another, and Sanctuary of Truth on another. Those first two would be full days of sightseeing. I am a single guy and am planning to travel to pattaya for my first time next year. I will be travelling solo, and before you ask, yes I will be indulging in all that walking street and surrounding streets have to offer. I would therefore appreciate any specific info you may have that you think would apply to me. 1) I am looking to stay for 2 weeks. Is this a reasonable amount of time to go to pattaya for my first time as i generally hear/read people going for 2/days? 2) I am looking to travel in April. I believe the high season is Nov to April is this correct? Is pattaya just as busy/mad outside of this time of year or does most of the establishments shut down out of season? 3) I will not be drinking the tap water, sticking to bottled water for obvious reasons. What about having ice in my drinks when I’m out or eating salads with my meals? (as salads are washed in the water). Would this cause me any problems? 1) If you are going to be enjoying the nightlife, 2 weeks is a good amount of time to be in Pattaya. It will fly by quickly and you will most likely wish you had more time. 2) November to April is the high season, the end of Songkran in April usually signals the beginning of low season. Since you are traveling in April, that is Songkran time. Some people love it, some hate it. If you are going to be there over those dates, make sure you don’t mind getting soaked every time you walk out the front door for a week. Low season is definitely slow in Pattaya. Tourist numbers dwindle during the hot and rainy season. Some of the bar staff go back home to visit family, there might be a few places that close for the season, but that is a rarity, most of the bars and restaurants all stay open with reduced staff. 3) In my experience, in regards to ice, I haven’t had any issues with any of the restaurants that cater to Westerners (the vast majority of them) or are owned by Westerners. They get it delivered and it is made from filtered water. While I have a friend that won’t have ice anywhere just to be safe, I think that’s over the top, as the tourists are where the money is and it doesn’t pay if your customers get sick. In regards to lettuce and veggies, I tend to avoid them unless they are the cooked variety. That being said I’ve had plenty of salads at places like the Pattaya Beer Garden, and haven’t had any issues. But the restaurants are well established and run by Westerners/catering to Westerners. I also avoid any fruit that can’t be peeled. Use your best judgment and you should be fine. Thanks for your reply to my questions. Can I just confirm that April would be the start of the rainy season? Actually I would mind very much getting soaked every time I left the hotel. Would the beginning of March be a better time to travel rather than April as I am quite flexibly (within reason) to when i can travel or would there be not much difference in the weather between March and April? Would you have any view on the March Hotel or H Boutique Hotel Pattaya? Would you know if these are guest friendly? Thanks, Mark, I was indeed referring to Songkran not the rainy season. Apologies for not getting back to you Rob, for some reason I wasn’t notified about your follow up comment.